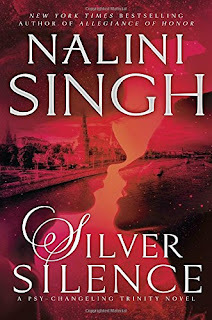 Silver Silence is the latest installment in Nalini Singh’s popular Psy/Changeling series. The heroine, Silver Mercant, will be familiar to established readers of the series as the assistant to cardinal telekinetic Kaleb Krychek, the hero of Heart of Obsidian. Silver Silence, however, stands alone. Even though Silence, the emotionless way of life ingrained in the Psy for generations, is no longer required, Silver clings to it. The discipline it offers protects her from one of her own gifts, making it a haven for her instead of the prison it was for some Psy. Still, she can’t quite tell the alpha of the StoneWater bear clan, Valentin Nikolaev, to leave her be. He uses any pretext his business with Krychek offers to contact Silver. Despite the excellent security in her building, he has a habit of showing up frequently. It’s a good thing for Silver that he does. One of his unexpected visits occurs while there’s an attempt on her life. Valentin saves her and, after conferring with her powerful grandmother, takes her into his clan’s den for safety. There, surrounded by the open affection and playfulness of the bears, Silver finds her silence cracking and her desire to experience an emotional life growing. She takes her first steps toward emotion tentatively, and Valentin, despite his obvious desire for her, restrains himself to her pace. Meanwhile, the bear clan’s welcoming nature and loyal support are working their own magic on her heart. The romance plays out against the background of conflict over the Trinity Accord, the agreement forged by Changelings, Psy, and Humans after the fall of Psy’s Silence. Not everyone believes in the pact, and some will stop at nothing to destroy it. Silver has a prominent role in the new administration, one that puts her at risk. Along with Valentin and Krychek, she deals with emergencies created by terrorists while trying to unmask the being who attempted to kill her. As Valentin and Silver grow closer, the stakes go up, both in terms of danger from without and of the risks posed by her abandonment of Silence. The characters are sympathetic and have depth. There’s also a lot of humor, some of it involving tabloid news media. The story moves at a good pace. Characters from other books in the series make brief appearances without distracting from the main story. Do you enjoy paranormal romance? 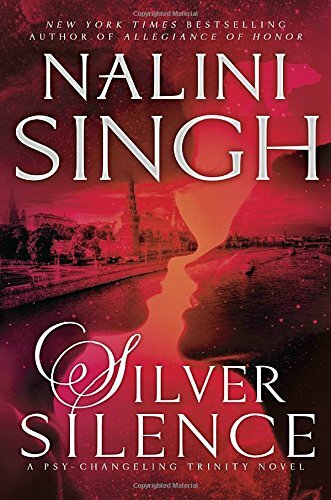 Have you read any of Nalini Singh's books? Do you like an alpha hero who can also find joy in uninhibited playfulness? I haven't read anything by Nalini, but this does sound like a very interesting book. I love an Alpha male who isn't afraid to find joy in uninhibited playfulness. Diane, I love the way Singh depicts bears in this story. The line "Because bears" is used very effectively. Paranormal romance is unique. I enjoy an alpha hero who doesn't take himself too seriously. You'll like Valentin, then, Traveler. He's wonderful. Nalini's novels are captivating. An alpha hero is always a treat. Petite, I agree with you! She is on my tbb list. I definitely enjoy paranormal and alpha males - I love when they make me laugh and cry. Catslady, I think you'll get some chuckles out of this book. I have read some of the books from this series and they were very good. She has created a unique world. Maureen, I agree that the world is unique. It's one of the things I enjoy about this series. I also think the Guildhunter books have a layered and unique universe, one totally different from the Psy/Changeling world. I bought an anthology for the library several years ago that had one of her Psy/Changeling stories in it. The mistake was mine, the cover had an adorable kitten on it. Not that many of our patrons read paranormal, and I often wondered at the reactions of the little old ladies who picked up the book because of the cover. They certainly had a bit of a shock when they read it. Anyway, I enjoyed the stories but haven't yet gotten an opportunity to read any more of her books.